At the beginning of the month, Apple was criticized for the security flaw in its iCloud file storage service that, according to multiple media outlets, allowed hackers to allegedly retrieve photos of a number of high-profile celebrities. And Now, the company’s newly launched iOS 8 has been reportedly found vulnerable to another critical bug that is troubling Apple iOS 8 users. After the launch of iOS 8, some minor bugs was reported in its operating system which was quickly fixed in Apple’s iOS 8.0.1. But, the critical vulnerability discovered in iOS 8.0.1 seems to be deleting data stored in iCloud Drive without the user's permission. The bug was uncovered by MacRumors after its forum members complaint about the issue triggered by the option to "Reset All Settings," which is typically supposed to reset your network settings to give your iOS device a clean slate to work with, but it turns out the feature is also deleting all your files from iCloud Drive. 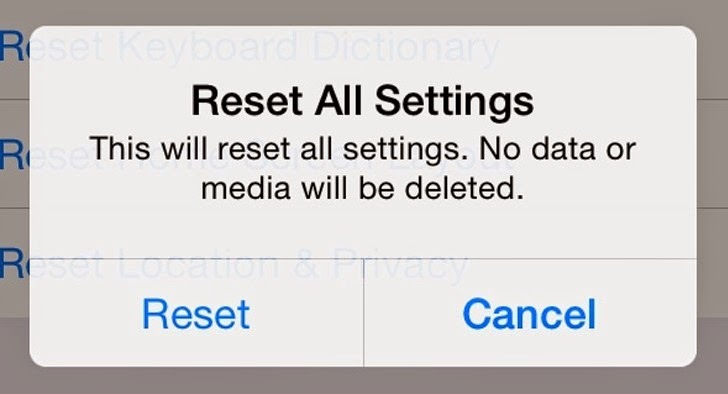 Under the General category in Settings for iOS 8, the Reset All Settings option is supposed to simply reset your iOS settings while retaining your data and media, as the option explicitly says that "No data or media will be deleted." But unfortunately, that's not the case with the users who have the new iOS installed in their Apple devices, as certain iCloud documents also wiped out after users press the Reset All Settings button. User comments on the issue also suggest that the bug seems to be specific to documents from iWork apps, such as Pages, Keynote and Numbers, according to MacRumors. There have been multiple confirmed reports from users who lost all of their iWork documents after using the option, and the user who first noticed the issue has reported that only Apple’s productivity apps were impacted, but other data files remained in iCloud. These documents don’t just vanish from the iOS 8 device, either. They disappear from the web-based iCloud Drive manager as well as systems running OS X Yosemite. Only you can retrieve all your documents from there, if you have a backup for your files. But, if you don't have a backup, your documents are gone forever. MacRumors conducted its own test on the bug and reported, "In our own testing, using "Reset All Settings" deleted all iWork documents stored in iCloud Drive on the iPhone and on iCloud.com. After allowing time for syncing to a Mac running OS X Yosemite, all of the documents disappeared from that machine as well. Preview and TextEdit documents, which cannot be accessed on the iPhone, remained untouched on the Mac." Until the issue is addressed by Apple, users who have iCloud Drive enabled are advised to avoid using the "Reset All Settings" option on their devices, in order to protect their important documents stored in iCloud Drive from getting erased. Apple’s iCloud was also in recent controversies when the highly-publicized celebrity photos were leaked online due to Apple’s insufficient security measures on certain functions.